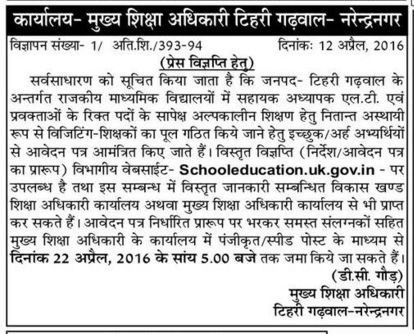 Notification for the recruitment of Guest teachers has been released for Tehri Garhwal. 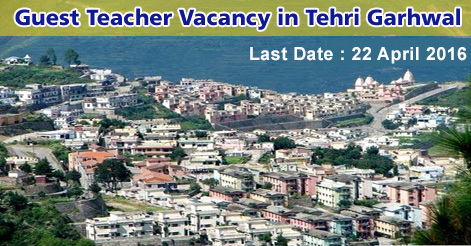 Guest teachers vacancies to be filled at vacant seats of LT & Lecturer in schools of Tehri Garhwal. Candidates applying for guest teachers in Tehri Garhwal district can now submit the application form. Application form should be submited to the Department of Block Education Officer through speed/ registered post till 22 April 2016. All candidates have to obtain guest teacher application forms from District & Block Education Offices or download the application form from the link given below. Completely filled application form with all testimonials/ documents is to be send at respective Block Education Office by Speed/ Registered Post till 22 April at 5:00 pm. 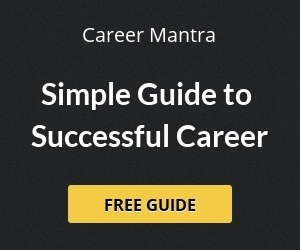 Help us to improve this article/job posting "Guest Teacher Recruitment in Tehri Garhwal". We would be glad if you can comment below and provide your valuable suggestions and feedback. If this page have any wrong information/list or out of context content, then you can report us as well. Guest Teacher Applications have to send at respective Block or District Education Office. I have completed my ma in yoga 2013 how many jobs in yoga teacher in garhwal. Sir I already reading school enter collage before 6 month . But now day change uttarakhand government. So sur again any re vacancy . I got only 3 month salry . kab sarkar yoga post bharti karigi.